Usually, dry glue is a sign that you need a new tube of adhesive. But researchers in Japan have developed a new type of glue that’s perfectly dry until you crush it—at which point it becomes super sticky. Adhesives that are solid at room temperature aren’t anything new, of course, but usually they require heat to melt them before use. What’s different about these small balls of glue, then, is that only mechanical force is required to activate their sticky potential. 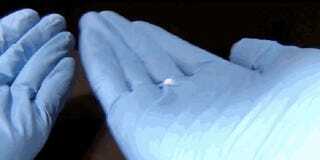 That’s possible because they’re actually beads of liquid latex coated in calcium-carbonate nanoparticles. You can roll them around your hand or store them in a pot without any adhesive action taking place, but when compressed the liquid latex bursts forth. The research was carried out by scientists from Osaka Institute of Technology in Japan and is published in Materials Horizons. The team points out that the glue is stronger than the kind of pressure-sensitive adhesives you find on Post-It notes, and reckons it could prove useful in applications where getting glue into a space without it sticking to things along the way is a concern.